This construction article briefly explains the process required for working out the cost of entire tile flooring. Here, measuring unit is taken as square metre. a. Initially, it is necessary to fill the flooring area having cement mortar (1:4 ratio) at a least thickness (50 mm). The thickness of the cement sand mortar may be raised to amend the height of the floor. b. After that, the tiles should be placed on the cement, sand mortar. Assume that total 133 numbers of tiles are necessary for this room. (the skirting tiles area is exempted here). 1.5 m3 volume of wet cement mortar is required here i.e. more volume is necessary once the water is added to cement and sand mix. Dry volume of mortar is taken as 25% of more of wet volume. 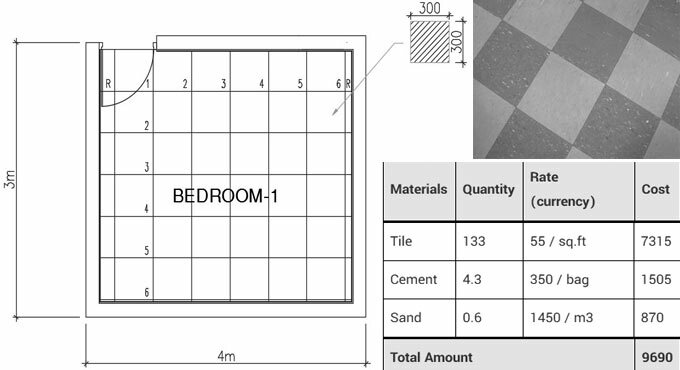 So, it is found that 4.3 Cement Bags, 0.6 m3 Sand and 133 number of tiles are essential for the room.